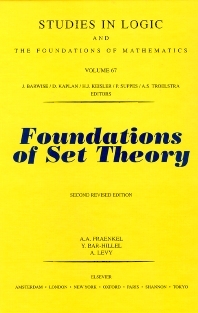 Foundations of Set Theory discusses the reconstruction undergone by set theory in the hands of Brouwer, Russell, and Zermelo. Only in the axiomatic foundations, however, have there been such extensive, almost revolutionary, developments. This book tries to avoid a detailed discussion of those topics which would have required heavy technical machinery, while describing the major results obtained in their treatment if these results could be stated in relatively non-technical terms. This book comprises five chapters and begins with a discussion of the antinomies that led to the reconstruction of set theory as it was known before. It then moves to the axiomatic foundations of set theory, including a discussion of the basic notions of equality and extensionality and axioms of comprehension and infinity. The next chapters discuss type-theoretical approaches, including the ideal calculus, the theory of types, and Quine's mathematical logic and new foundations; intuitionistic conceptions of mathematics and its constructive character; and metamathematical and semantical approaches, such as the Hilbert program. This book will be of interest to mathematicians, logicians, and statisticians.